It’s January 1944. Franklin Delano Roosevelt is nearing the end of his third term. He is just back from the Cairo and Tehran Conferences where he met with the leaders of Britain, Russia and China. The purpose of the meetings was to discuss strategies for defeating Germany and Japan and how the Allies would manage the peace once the war had come to an end. Returning home, FDR is concerned that, once the war is over, the country may repeat the retrenchment and isolationism that followed W.W. I. He uses the occasion of his 1944 Annual Message to Congress, his first major speech after returning from the Mideast, to argue that Americans need to pull together not just to win the war, but to build a strong and robust post-war economy. But that can’t happen, FDR believes, if large segments of the population are left behind, as they were in the Great Depression, an era of massive unemployment and poverty that marked the initial years of Roosevelt’s presidency. To ensure that doesn’t happen again, FDR proposes an Economic Bill of Rights to supplement the political Bill of Rights handed down from the founding of the Republic. He envisions the U.S. as an economic powerhouse second to none in the world – a country in which no one lives in poverty or wants for the necessities of life, including a living wage, a decent home, quality medical care and education. Normally Roosevelt would have delivered his speech in person before Congress. 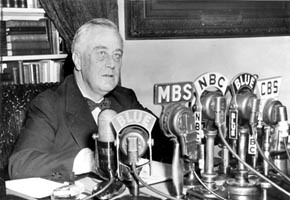 However, FDR was apparently ill with the flu and chose instead to deliver the speech by radio as a fireside chat from the White House. People who are hungry and out of a job are the stuff of which dictatorships are made.In our day these economic truths have become accepted as self-evident. We have accepted, so to speak, a second Bill of Rights under which a new basis of security and prosperity can be established for all regardless of station, race, or creed. 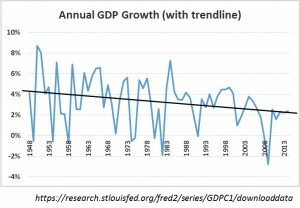 Today, we are experiencing some of the slowest economic growth in modern history. Wages are stagnating and people are finding it increasingly difficult to find decent jobs. 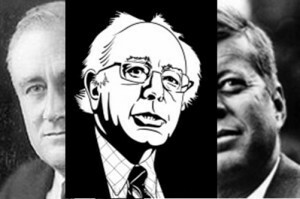 Of all the candidates, Bernie Sanders in particular has been unequivocal in his call to tackle poverty and wage inequality in the tradition of FDR and the New Deal. Let’s be clear, it is a national disgrace that 46.5 million Americans are living in poverty today, the largest number on record. It is a national disgrace that at 21.8 percent, the U.S. has the highest childhood poverty rate of any major country on earth … Here in the United States, significant progress has been made but much more needs to be done to provide dignity and opportunity to all Americans regardless of income. Franklin Delano Roosevelt has a “Special Place in Heaven” among liberal Democrats. And from that special place, we strongly suspect that FDR is cheering Bernie on and praying that he will finish the work that FDR began more than 70 years earlier. 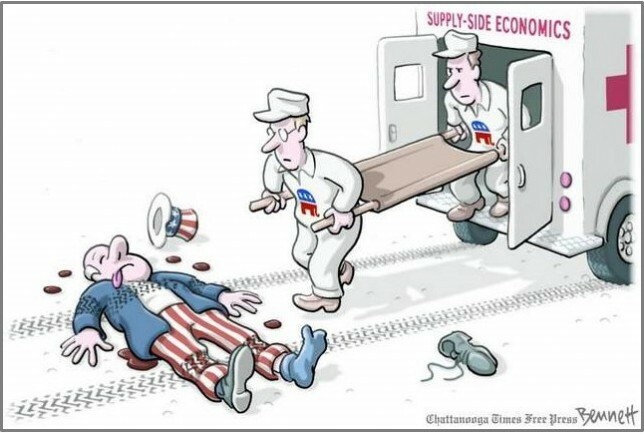 The U.S economy is hurting. Despite massive stimulus programs and historically low interest rates, the economy remains mired in a slow growth cycle characterized by low labor force participation, wage stagnation and a lack of adequate investment. To get the economy moving again, we may need to draw on lessons learned from past generations. 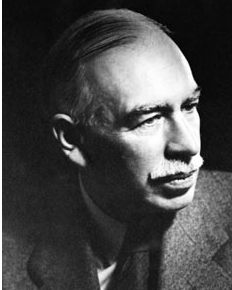 John Maynard Keynes was a British economist who departed from neoclassical theory to argue that government held the power through monetary and fiscal policies to mitigate boom and bust cycles and stimulate economic growth. In the U.S., Keynes theories were embraced by Franklin Roosevelt as a cornerstone of the “New Deal” that helped lead the U.S. out of the Great Depression and through World War II. In the Post-War Period of the 1950’s to the 1970’s, the “Keynesian Revolution”, as it came to be known, underpinned one of the most robust periods of economic growth in the Nation’s history. In the 1970’s and early 1980’s, however, double digit inflation helped give rise to “supply-side” economics which argued that excessive government taxation, spending and regulation were at the root of the problem. Supply-siders maintained that, contrary to Keynesian doctrine, lowering taxes and reducing government spending would help tame inflation, lead to an increased supply of good and services and stimulate a sustainable level of demand. Meanwhile, wealthy individuals and corporate interests in the U.S enthusiastically embraced supply-side economics because it argued for lowering high marginal tax rates. To generate public support, supply-side economics was sold as a pro-small business, anti-government initiative to unleash the creative energy of the private sector to generate economic prosperity. For a while it actually seemed to work. Inflation was brought under control when the Federal Reserve under Paul Volcker aggressively raised interest rates in the 1980’s. Republican and Democratic administrations lowered marginal tax rates. And the economy boomed during much of the 1990’s. 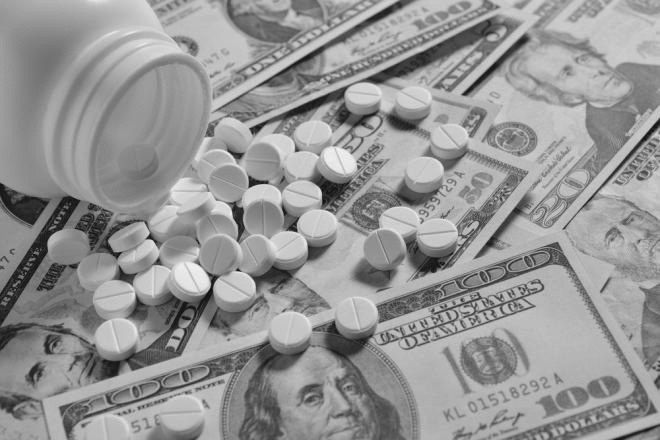 If anything, supply-side economics worked too well – until it didn’t. Not only were taxes lowered, but government regulation of the financial services industry, for example, was weakened to the point that credit become much too easy. An asset bubble ensued in the late 1990’s and 2000’s, led by the housing market. Bad loans were re-packaged into complex financial instruments, known as “Credit Default Swaps,” that few people, including rating agencies and government regulators, understood. And it all came crashing down in a wave of defaults leading to the Great Recession of 2008 and 2009. The U.S. responded with a combination of monetary and fiscal stimului. It was labelled by some as a “Keynesian Resurgence.” On the monetary side, the Federal Reserve aggressively bought bonds under a “quantitative easing” program that pumped billions into the banking sector to help keep interest rates low and increase lending and investment. And the Administration and Congress did their part by adding about a trillion dollars to government spending programs over a several year period starting in 2009. However, the stimulus programs were offset by cuts at other levels of government; by consumers ratcheting back their spending as housing values plummeted and unemployment increased, and by banks and businesses reluctant to take on additional financial risk in a slow growth environment. 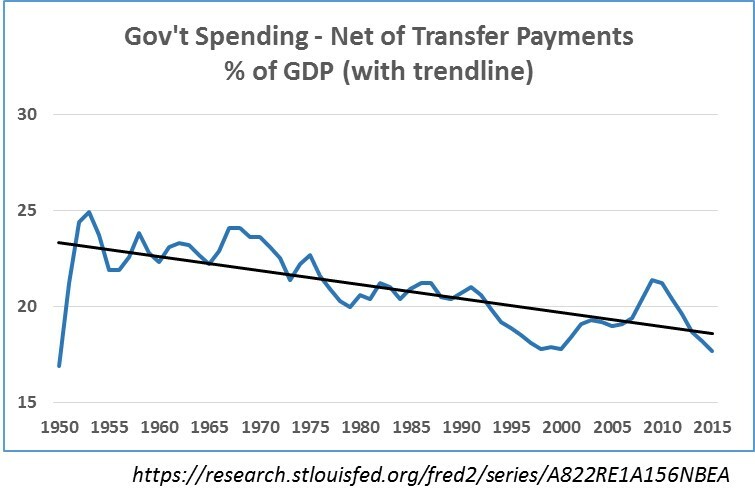 As illustrated in the graph at left, government spending at all levels as a percent of Gross Domestic Product (17.7% in 2015) is now at the lowest level since 1950. In hindsight, the so-called stimulus after the Great Recession seems a minor blip up on an otherwise persistent downward trend line. 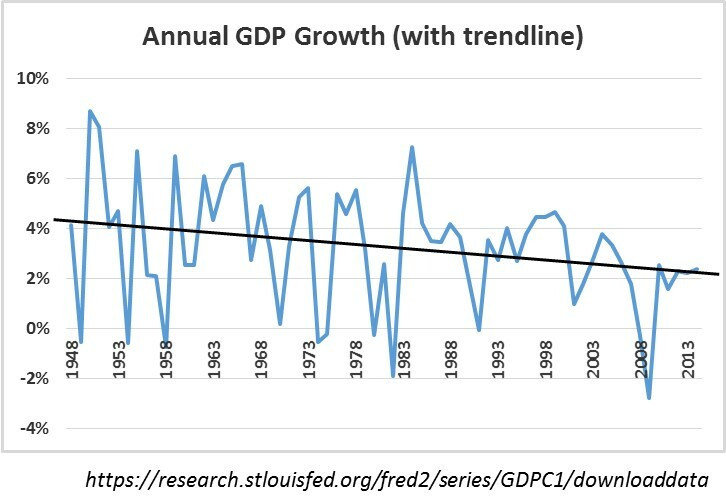 A similar trend is evident when looking at economic growth rates (see graph below). Today the economy is struggling to maintain 2% growth in Gross Domestic Product (GDP) – the lowest average rate in generations. So, as you listen to the Presidential candidates debate economic issues, bear in mind that, if you cut through the populist rhetoric, much of what you are hearing is a debate on how to fix the U.S. economy. 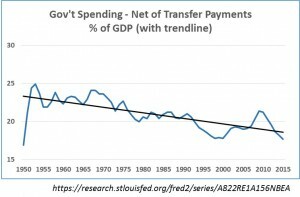 Bernie Sanders is effectively arguing for a Keynesian approach, similar to the New Deal, with relatively high marginal tax rates and government sponsored investment in people and infrastructure to stimulate growth. Hillary Clinton may not identify as a “supply sider,” per se, but her approach to economics is much more traditional and conservative, looking to constrain government, keep marginal tax rate low, and rely more heavily on the private sector to stimulate growth. It is a debate worth having, but at the end of the day the U.S economy is hurting badly, more so than many of our political leaders are willing to admit. Realistically, it may take a “Second Keynesian Revolution” to restore the economy to sustained pre-Great Recession rates of growth. Got your Letter entitled “Transforming The Democratic Party.” Completely agree that this election is not just about who wins the nomination, but about the future of the Democratic Party and the Nation. In recent years, Democrats have lost down-ballot elections on a massive scale. Even though a plurality of Americans identify as Democrats, Republicans control both houses of Congress and the majority of governorships and state houses. Democrats have been ineffective in challenging anti-government and “supply-side” propaganda and countering Republican orthodoxy on issues such as taxes and gun control. The Democratic Party platform is more an amalgam of justifications for current policies – not a blueprint for meaningful reform. Mainstream Democrats, including President Obama and Hillary Clinton, often seem as if they are in denial. They fail to acknowledge that excessive money in politics has created a rigged election system and an economy that is working only for those at the top of the income scale. At a time when wages have stagnated, and more and more Americans are finding it difficult to find decent paying jobs and make ends meet, many in Democratic leadership positions seem intent on asking us to believe that all is well – it will just take a few tweaks to the existing system to make things right again. Bernie, you have shown the ability to lead with a bold, clear message emphasizing that the system needs, not minor tweaks, but major reforms. Among other things, we need to take excessive money out of politics; fight rising poverty levels; make education affordable all, and stimulate broad-based economic growth that benefits all the people, not a privileged few. Your direct message has energized voters, particularly the young. You have proven that you can compete by raising money in small dollar contributions from real people, not special interests. That’s the future of the Democratic Party – engaging voters at the grassroots level by fighting for real reform – by letting people know we will no longer tolerate a system that favors special interests over the poor and working people of this country. You have made an historic contribution to the future of our Party and the Nation. 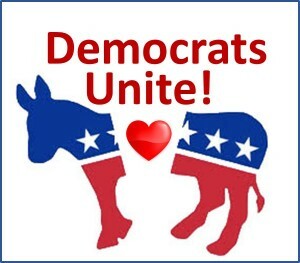 Regardless of who wins the nomination, as President or as Senator from Vermont, we hope you will work to help rebuild the Democratic Party and make it once again into a vital and progressive force in American politics. Thank you for your leadership, now and in the future. After her decisive win in New York, Hillary Clinton is the “presumptive” Democratic nominee for President, according to many in the mainstream media. Still, the electoral terrain going forward is mostly Northeast and West Coast states that are favorable to Bernie. It may be a long shot that he overtakes Hillary in the delegate count, but he will keep it close. Meantime, Bernie is running virtually even with Hillary in the national polls, an astounding 35% gain in just about 10 months. For her part, Hillary has been losing support at almost as fast a pace, and her “unfavorable” rating among Democratic and Republican candidates going back to 1992 is second only to – you guessed it – Donald Trump. So Bernie will almost certainly compete all the way to the Democratic convention in July, and the nomination itself likely will be contested. On the surface, the contest is about who will be the nominee. 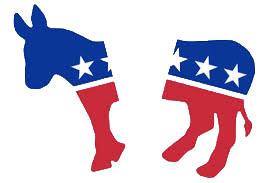 But, behind the scenes, there is already a big debate taking shape about the future of the Democratic Party. It is about how to harness the energy and enthusiasm that Bernie has generated, particularly among the young, not just to win the Presidency, but to take back Congress and the state houses. That’s the only way to really “Get Things Done,” as Hillary likes to say. Given the acrimony that has characterized the campaign of late, Hillary may be tempted to forsake Bernie and his supporters, to go it alone against the Republicans. The Republican attack machine is already gearing up to tear her down, and it won’t be that difficult given her negatives. Even if she wins against the likes of Donald Trump, she and the Democratic brand could be permanently damaged, and it will be difficult, if not impossible, to get anything done for years to come. Hillary can help avoid that scenario. Among other things, she can call off her surrogate attack dogs, praise Bernie in public, and reach out to him behind the scenes to develop a common, progressive agenda that brings the Democratic Party together around a bold vision for the future. With this Congress, most of the things likely to “Get Done” will only exacerbate income inequality and make matters worse for the poor and working classes of this country. That’s where Bernie and his supporters come in – it’s about the long haul – taking back Congress and changing the fundamental direction of the Democratic Party and the Nation. Many Democrats are exhorting Bernie to stop criticizing Hillary to avoid further damaging her prospects in the general election. And that is probably not a bad idea. But Hillary also needs to do her bit by showing Bernie (and his supporters) a little love. First, a little history: Up until the late 1970’s, the Democratic Party had two main factions: Conservative and Liberal. Conservative Democrats were mainly in the South; Liberals mainly in in the North and on the West Coast. Then came an historic shift: many conservative Democrats in the South switched party allegiance starting with the 1980 election of Ronald Reagan. In response, the Democratic Party also shifted right. Bill Clinton, fundamentally a conservative Democrat, was elected in 1992. Examples of the party’s rightward tilt in the Clinton Administration include passage of the Crime Bill of 1994 that resulted in the mass incarceration of non-violent drug offenders, particularly African Americans. In addition, the Glass-Steagall Act was repealed in 1999 allowing big banks to engage in both commercial and investment banking without adequate safeguards. More generally, mainstream Democrats bought into Republican supply-side propaganda and the notion that government was inherently evil and only private enterprise could lead the way to continued growth and prosperity. Conservative Democrats took over the party, and for much of the 1990’s, the conservative tilt seemed to be working. The economy grew at a robust rate. “Liberal” become a dirty word. Then, starting in the early 2000’s, things began to change. The U.S. became mired in unnecessary and counter-productive foreign wars. Funds that should have been invested in the U.S. flowed overseas, helping stifle U.S. economic growth. And then the deregulation of the big banks under Glass-Steagall, lax lending standards and mounting credit defaults, came home to roost with the stock market crash of 2008 and early 2009. Since then, economic recovery has been slow and painful. Fed policies to stimulate economic growth have largely inflated asset values, primarily benefiting the wealthy and exacerbating income inequality. Fiscal policies that could have helped stimulate a broader and more robust recovery, such as increased investment in infrastructure, were much too tepid thanks to a “do-nothing” Congress. Today, led by Bernie Sanders, we are witnessing the resurgence of the Liberal wing of the Democratic Party. The conservatism that began with the Reagan revolution of the 1980’s has not worked, liberals argue, and it is time to re-think our priorities. We need a progressive system of taxation and more investment in infrastructure and in people, similar to policies that led to robust growth and rising wages in the post W.W. II period through the 1970’s. We should also be looking beyond our borders, as Bernie frequently suggests, to countries such as Canada, the UK, France, and Denmark – countries that have managed to guarantee quality health care for all at much lower per capita costs than in the U.S.
Hillary is not just conservative; she’s a neo-conservative who would use Henry Kissinger as a foreign policy adviser and who refuses to criticize Israel’s treatment of Palestinians under Netanyahu. She does not favor progressive taxation, as she signaled in yesterday’s Brooklyn debate with her refusal to agree to lift the income cap on Social Security contributions, a small but significant step towards helping address income inequality. Bernie, on the other hand, has demonstrated that liberalism can generate the kind of excitement that energizes voters and will likely lead to fundamental changes in the makeup and direction of the Party for years to come. What Sanders is proposing is not a tweak to the existing system. It is akin to the trust busting era ushered in by Teddy Roosevelt and the Progressive movement at the turn of the last century. Hillary Clinton, by contrast, favors strengthening the current system but not fundamentally altering it. She defends the repeal of Glass-Steagall in the late 1990’s which prohibited banks from engaging in both commercial and investment banking. And she supports Dodd-Frank which was passed in 2010 to regulate the risky financial behaviors that led to the crisis of 2008. But under Dodd-Frank, as Berkeley economist and former Labor Secretary Robert Reich points out, the big banks – JP Morgan Chase, Citibank, Goldman Sachs, Well Fargo and Bank of America among others – have only gotten bigger, and many of the regulations that were supposed to mitigate risk have yet to be implemented. There is a strong argument to be made that Dodd-Frank has been hijacked by the big banks. It isn’t working and is unlikely to prevent another major financial crisis. Hillary Clinton disagrees, but then, as Sanders repeatedly suggests, she is a major recipient of Wall Street campaign donations. Supporting the current regulatory system, as Clinton does, works to the advantage of the big banks because they get to write the rules. Taking his cue from Teddy Roosevelt and the Progressives, Bernie is right – it is time to break up the big banks. Sometimes you need to think big and act boldly to get the job done. Mainstream Democrats pander to Wall Street and fail to stand-up and oppose unnecessary and counter-productive foreign wars. For decades, Democrats have acquiesced in regressive tax policies resulting in huge tax breaks for the wealthy at the expense of the poor and working class. Democrats, like Republicans, accept big money donations from corporations and special interests. The result is government policy skewed in favor of the rich while wages for average Americans stagnate. · Raise tax rates on high wage earners and “unearned” income such as dividends and capital gains · Invest in people – citizens have a right to a decent education, job training and quality health care. Medicare for All! These are not radical new ideas. They are common sense policies, similar to ones championed by Democrats since the days of Franklin Roosevelt and the New Deal. Starting in the 1980’s, however, the party lost its way. Not only did Democrats fail to oppose Republican “think tanks” spewing supply side propaganda, they tacitly bought into the premise that government is bad and only private enterprise can lead the way to growth and prosperity. We need government that works for the people. Only one candidate has consistently championed progressive policies designed to support the poor and working classes of this country. National defense, roads and bridges, police and fire protection: All are managed by government, and all have “socialist” elements. 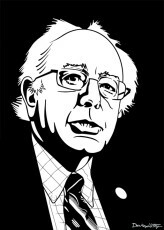 Is Bernie Sanders really such an outlier? Is quality health care for all beyond our reach? In balancing such questions, America has some things to teach other nations, but we could also learn from them as well. 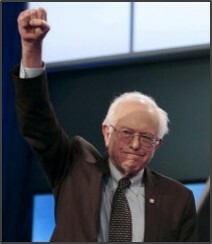 As our presidential election moves forward with a candidate named Bernie Sanders invested in it, we American voters are becoming used to hearing the “S” word thrown at Sanders. I grew up thinking that socialism was a dirty word until I learned that pretty much every American is, in actuality, at the very least, part socialist in nature. When I run into a voter who is determined to shrink the size of our government, my first question is always this. I ask my friend if they want to do away with our American armed forces? Of course not, is the immediate reply I always receive. At this point I accuse my friend of being a socialist. Yes, most of my friends and acquaintances be they liberal, conservative or somewhere in between, want our America to have a military force, federal, state and local police forces, local public firefighters and a healthy infrastructure of roads and bridges that allow for us to move about our nation in safety. And we also want our America to be a home for private enterprise. In other words, we want our America to continue to be an example of socialist capitalism that has worked for us for over two hundred years. As for my views, I think we have done well by our mix of capitalism and socialism. The most prominent example of our socialist actions, for me, is our decision to make the creation and health of our local, state and federal roads and bridges the responsibility of all of our local, state and federal governments. And the good news is our governmental infrastructures were a piece of our nation that allowed for so many private enterprises to create, expand and become successful businesses that relied on travel within our nation. Now I admit that I go a little further than some of my more conservative/socialist friends when I acknowledge the wish I have that someday, my country, just like so many of our allied nations around the world, will provide each and every American citizen not only with the ability to travel everywhere on roads within our nation, but also the ability to receive health care that will be created for everyone through the same taxation system that currently provides us all with roads and bridges, military protection against outside forces and police and fire protection on local levels. I’ve been to places like Amsterdam in the Netherlands, and, believe me, the people of that country are overwhelmingly happy to be a part of a community that provides one and all with health care and seriously works to care for one and all within their nation. In my opinion, we have a lot that we can teach other nations and we could also learn a lot from them.